Lessons 1 and 2 are the most `technical' in this Module. A good understanding of the structure of wood, and its properties, is helpful to achieve wise use. Woods are grouped into `hardwoods' and `softwoods'. The terms are not entirely correct since some `softwoods' are harder than some hardwoods'. For example tamarack (eastern larch), a softwood, is harder than trembling aspen, a hardwood. However, the structure of the wood is different for the two classes. A better classification would be needle-bearing trees and broad leaved trees. 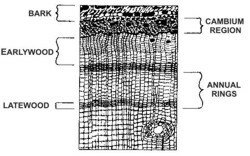 Figure 1 - Cross-section of pine showing cells of cambium region, wood, bark and annual rings. When a tree seed germinates, it sends up a shoot of soft pith around which a layer of wood is formed. In a temperate climate like Nova Scotia, growing seasons are well defined: spring, and summer/fall. As the young shoot grows the following year, another layer of wood is formed. This annual growth pattern creates a series of circular or annual rings.When growth resumes in the spring, earlywood (or springwood) is formed. Springwood is usually light in colour and of low density. It contains much of the wood tissue that conducts water up and down the tree. Wood produced later in the growing season is called latewood (or summerwood). It is usually denser and darker than springwood. A freshly cut cross-section of a tree shows a layer of earlywood and a layer of latewood which form the annual rings (see Figure 1). 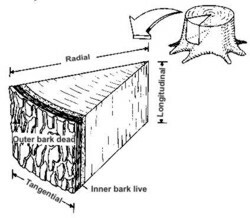 Figure 2 - Cross-section of pine showing resin duct, wood rays and cells. Cells - Using an inexpensive magnifier, the holes you see on the end-grain of wood are cells. These cells are shaped like very small tubes with closed, pointed ends which are packed closely together in rows in the radial direction (see Figure 2) usually in a straight line from pith to bark. Figure 3 - Longitudinal cells illustrating pits. walled and have large cavities while those of the latewood have thicker walls and smaller cavities. This difference in cell wall thickness between summerwood and springwood accounts for the differences in density between the two layers mentioned in the previous section. Some of these longitudinal cells provide a mechanism for passage of water or sap up and down the tree by means of interconnecting channels through the cell wall. 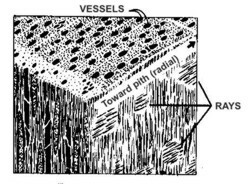 These openings between cells are known as pits (Figure 3) which allow an unbroken communication from tree root up to the crown. The cells also provide strength to the tree stem. Rays and Resin Ducts - Two other features appear in the magnified cross-section. The first are long, radial lines running between the rows of longitudinal cells. These rays (see Figure 4), are composed of horizontal cells usually in groups. In softwoods, rays are very small and are not readily seen with the naked eye. Second are resin canals or resin ducts (Fig. 2), which appear on the cross-section interspersed among the normal longitudinal cells. They are absent in some species, very noticeable in others - particularly pines, and are useful in identifying these woods. 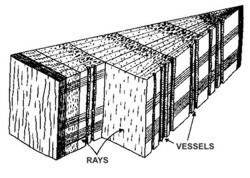 Figure 4 - Cross-section through hardwood showing rays and vessels. The Cambium - Another important element in tree growth and wood formation is the cambium. It is a single layer of living cells located between the inner bark and the wood in both softwoods and hardwoods. All wood originates at the cambium, except for twig and root tips. These cells are responsible for increases in tree height and branch and root length. The cambium might be thought of as a "rubber glove" enveloping the entire tree - trunk and branches. Cells in the cambium reproduce by division and deposit identical new wood cells on the previous layer. At the same time, bark cells are deposited on previous bark layers on the opposite side. This is how a tree grows -layer upon layer of wood cells being continually deposited during the growing season. Bark, as it grows old and dies, does not become extremely thick because it is sloughed off continually so that only very small increases in thickness occur during the life of a tree. Vessels or Pores - Examining a cleanly cut cross section of yellow birch or sugar maple, you will see a surface that has a number of visible holes (much larger holes than in the softwood section) interspersed within what appears to be a solid surface. These holes are called vessels or pores (see Figure 5). They conduct water up the stem and provide channels for delivery of food to living cells, particularly at the cambium. They do not occur in softwood. The remainder of the hardwood substance is largely made up of longitudinal cells similar to those in softwoods. However, the longitudinal cells in hardwoods are usually much smaller than in softwood and cannot as a rule, be seen with a magnifier. They are also much shorter. 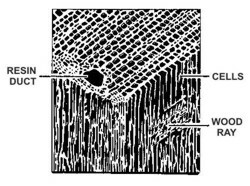 Figure 5 - Cross-section of a diffuse-porous hardwood. Because of the presence of vessels, or pores, in hardwoods we refer to these species as porous, and softwoods as non-porous. Depending on the distribution of the pores, or vessels, hardwoods are further divided into (a) ring-porous woods and (b) diffuse-porous woods. In maple or birch the vessels are more or less randomly distributed across the annual ring as in Figure 5. The maples and birches are diffuse-porous woods. In the case of ash, elm, or oak, the vessels are largely concentrated in the inner, springwood, portion of the ring, forming a distinct ring of their own (see Figure 4). These are known as ring-porous species. Ring-porous woods exhibit smaller vessels elsewhere across the ring, but large ones occur in the springwood, accenting annual rings. Rays - Hardwoods do not contain resin ducts but they do have rays. You will recall that ray cells run horizontally across the tree stem (cross-section) in a radial direction. In hardwoods the rays vary greatly in character between species. In birch the rays appear as fine lines similar to softwoods. In sugar maple the rays are wider and more distinct, and appear as noticeable flecks on the tangential surface. 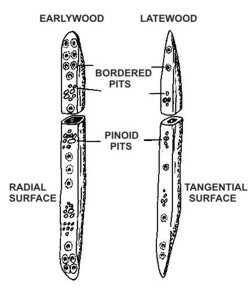 Tangential, radial and longitudinal represent the three different directions (planes) in a piece of solid wood (see Figure 6). Figure 6 - Three planes used in describing cross-sections. In soft maple, they are less distinct but appear as staggered ridges on the radial face. Red oak shows its wide rays very clearly and, together with the large ring-oriented pores, create the distinctive grain pattern of this species. Wood grain has a variety of meanings. The most widely accepted meaning refers to the direction that wood will split. For example, straight grain, or cross grain. Axe handles are made from straight grained ash. Grain also describes the size and arrangement of cells in the wood. As mentioned earlier, this feature gives oak its distinctive appearance. Carpenters and cabinet makers use the term open grained (or coarse grained) for some ring-porous hardwoods. Diffuse-porous hardwoods and softwoods are often referred to as close-grained (or fine grained) woods. Finally, grain can describe how a piece of lumber was sawn in relation to the annual rings in the tree. 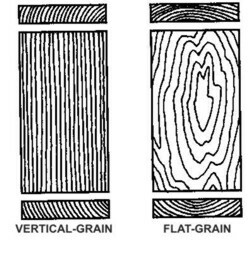 Edge-grain (quarter sawn) and flat grain (flat-sawn) are shown in Figure 7. Figure 7 - Characteristics and slope of grain. Texture is another term used to describe grain. It usually refers to the size of the cells and is described as fine-textured, even-textured, or coarse-textured. For example, white pine is regarded as fine-textured. The oaks are course-textured. Being a natural substance, wood varies greatly, even within the same species. The following examples show what variations you can expect to find. Variation in density in hardwoods is greatest for the ring-porous species. As growth slows, the large vessels, or pores, in the springwood of the rings make up an increasingly greater proportion of total wood substance. Since the pores contain large cavities the amount of wood substance (longitudinal cells) becomes quite small. This results in very light, low density wood. Note: Density, as will be seen in Lesson 2, is an excellent indicator of many wood properties - particularly strength and yield, as related to the production of pulp. Reaction wood is abnormal wood that occurs in the boles of leaning and crooked trees (and in branches). It results in abnormal rings wider on one side than the other and is formed by the tree to counteract lean. It is the tree's response to this stress and its attempt to straighten itself. In hardwoods, this tension wood forms on the upper side of the lean. In softwoods, this compression wood forms on the lower side of the leaning tree. Tension Wood - Tension wood, formed on the upper side of leaning hardwood trees, is usually indicated by eccentric, or off-centre, growth rings (see Figure 8a). It may be seen on cut ends as a somewhat lustrous surface, sometimes with an uncharacteristic colour. On a piece of lumber it may often be detected by a fuzzy or woolly surface. Tension wood may cause warping during drying, and in general is of lower strength than normal wood. When a piece containing tension wood does break, it shows a brashy failure - ie. a rather abrupt failure across the piece, without the usual splintering as in normal wood. Hardwoods showing large amounts of tension wood are generally not acceptable for products where strength is a factor, or for some grades of peeler logs. Compression Wood - Compression wood, formed on the underside of leaning softwood trees, is usually detected by: (1) a dark, reddish, colour; (2) annual rings on the underside that are wider than normal and appear to have a high proportion of summerwood (see Figure 8b); and (3) a dull appearance. Although compression wood has a higher than-normal density, it is weak in some critical strength properties. The most serious drawback of compression wood is its abnormal drying behaviour. When normal wood in the form of lumber dries, it shrinks in thickness and width (by predictable amounts). It shrinks very little (practically negligible) in length. Compression wood, however, shrinks in length by more than 10 times that of normal wood. This causes bowing and twisting of certain pieces of lumber. Compression wood is more easily recognized than tension wood and should be avoided where strength is a prime requirement. While a tree is young the wood conducts water (or sap) up the tree, stores food for growing, and provides strength to the tree stem. This wood is called sapwood. Later, as the tree grows in diameter, the cells toward the centre (pith) of the stem die. This core of dead cells around the pith is called heartwood. As the tree grows, the core of heartwood moves outward as well. There is great variability in the proportion of sapwood to heartwood. In some woods, when the cells die and form heartwood, noticeable changes take place. The most common change is a darkening in colour of the heartwood. Red oak and eastern white cedar are good examples of this darkening process while the eastern spruces, balsam fir, and other hardwoods show practically no colour change in the heartwood. Heartwood should not be confused with the darkening in colour due to activity of decay organisms. Important changes occur when heartwood is created by dying sapwood cells. In some woods - cedars and white oak for example -chemicals are deposited in the heartwood cells which impart a high degree of natural decay resistance. In other species, the cells are completely blocked by another kind of deposit that, in turn, reduces its ability to conduct water. This means that water is difficult to remove during drying. For the same reason, liquid preservatives are difficult to introduce beyond the sapwood. We have touched on some of the features of wood that will help with identification. If you want to learn more about wood identification we suggest (1) Canadian Woods. 3rd Edition (see below); (2) Forintek Canada Corp., 319 rue Franquet, Ste-Foy, Quebec, GlV 4CF, have small, labelled wood samples available, in boxes of 40 ($100 per box for non-members; $50 per box for supporting members of Forintek); (3) You may wish to make up your own samples 1/4 in. thick, by 2 ½ inches by 4 inches. They should be dry. With the above noted key, or by simply observing prominent features, you will become proficient at identifying local species. Forest Products and Wood Science. Second Edition, Iowa State Univ. Press, Ames, IO. Hoadley, Bruce, 1981, Understanding Wood, The Taunton Press, Newton, CT.
Canadian Woods - Their Properties and Uses. Third Edition, Supply and Services Canada, Ottawa. Panshin, A.J. and Carl de Zeeuw, 1980, Textbook of Wood Technology, McGraw-Hill, New York. Ward, J.C., R.A. Hann, R.C. Baltes, and E.H. Bulgrin. 1972, Honeycomb and Ring Failure in Bacterial Infected Red Oak Lumber After Kiln Drying, USDA Forest Service, Madison, WS.